I simulated a bunch of QHAs and dual QHA combinations using the NEC2 simulation software. To aid in generating the NEC2 models, I wrote a simple and stupid (and incredibly ugly) program in C to automatically generate NEC2 source code according to given QHA dimensions (height, diameter, number of twists and so on). It can generate either a single QHA or multiple QHAs stacked according to your preference. It does not generate QHA dimensions for your design frequency—for that you'll want to use John Coppens's Quadrifilar online calculator. Take the dimensions it gives, and plug them into helix2nec. If you like, you can download helix2nec.c. It's not pretty. You can also download an example input file, dual_435.helix, which creates a NEC2 model of the 2 m and 70 cm combination, and tells NEC2 to simulate it in the UHF range. The first line defines how many helices there will be. All lengths are in millimeters, measured from the center of the conductors. The model must contain precisely one helix with feed type F, other helices must be terminated, open or shorted. The last line specifies the start frequency, end frequency, and frequency increment, in MHz. This will produce a left-hand helix with standard feedpoint configuration. When the feedpoint is located at the top, the antenna will radiate skyward with right-hand (RHCP) circular polarization. See below for how to choose the twist direction and feedpoint configuration, if you want other polarization or radiation direction. If you want to model a QHA with right-hand twists, specify a negative number for the number of twists in the input file. 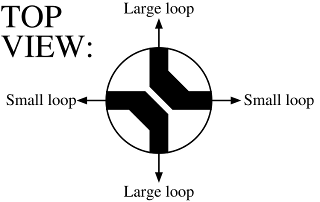 To get an anti-standard feedpoint, exchange the dimensions of the larger loop and the smaller loop with each other. There is no simple way to move the feedpoint to the bottom, so if that's what you need, just stand on your head when you view the results. Do not complain about what the program does, or doesn't do. I do not support it in any way. With very minor changes, the QHA can be tailored to radiate upwards or downwards, with RHCP or LHCP polarization. The two factors that determine the antenna's properties are (1) the direction of the helices (i.e. 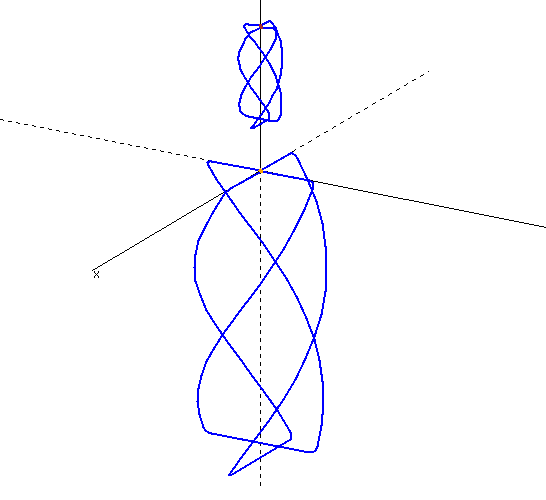 the direction of the "twist" of the antenna) and (2) the connection of the feedpoint. Do not assume that left-handed twists automatically mean left-handed polarization! It is, in fact, the exact opposite! Direction of the helices: This is rather simple. The picture on the left shows one QHA with left-hand twists. They are in the opposite direction as the threads on a screw. 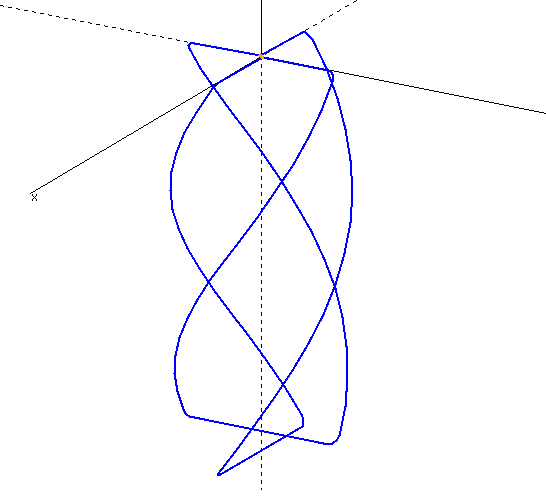 A QHA with twists going in the same direction as a screw, as shown in the images on the right, has right-hand twists. Connection of the feedpoint: This is a bit more subtle. When the antenna feedpoint is at the top of the antenna (which for some reason seems to be the commonly used arrangement, perhaps because it enables making sleeve baluns for the feed; something I've never done myself) the two loops can be connected according to the diagram on the left. Note that the diagram is looking down on the antenna feedpoint from above; as labeled on the diagram, it is a top view. The coaxial feedline is connected to the two thick black areas (they represent conductors on circuit board). It does not matter which one is the center conductor and which one the coax shield. I shall hereby call this connection the "Standard connection" (just because this is how I connected the QHAs at my station). The first row represents my station's QHA antennas: skyward radiation with right-hand circular polarization. The second row, where both the twist direction and the feedpoint have been mirrored, is a complete mirror image of the entire antenna. It is therefore logical that it should otherwise work the same as the original, but have opposite (left-hand) polarization. The third and fourth row describe antennas that differ from the first one in only one parameter (twist or feedpoint). They provide either RHCP or LHCP polarization, but they radiate downward, into the ground. 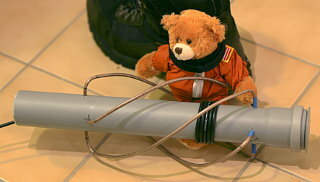 That might seem useless—unless the antenna is hung from its feedpoint (feedline going up), and used to transmit telemetry from a high-altitude balloon! Alternatively, you can mount the entire antenna upside-down, i.e. with the feedpoint at the bottom, and get skyward radiation. Try this, if you think a bottom-fed antenna would be more convenient for your application. If you build a QHA for satellite use and find that it does not work, please check, double check and triple check the twist direction and especially the feedpoint connection, and their resulting radiation direction with respect to the location of the feedpoint. It is all too easy to design a QHA for sky coverage, but build one that radiates down into the ground. 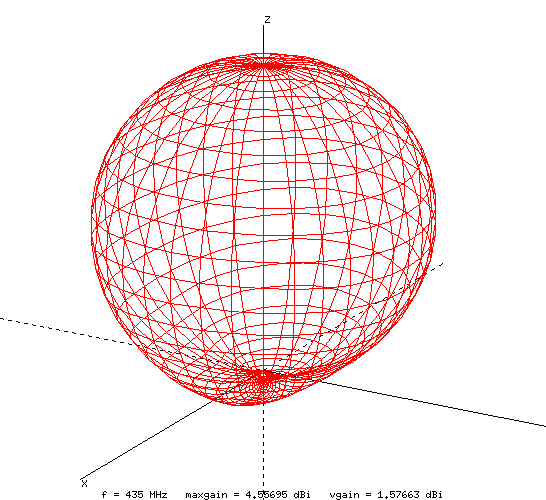 This is a NEC2 model of a single QHA. The feedpoint is at the top. This picture shows what I wanted to make. The two QHAs are completely independent, but the 70 cm QHA is built inside the 2 m QHA. Since the 2 m antenna is resonant also on 70 cm, I was worried the outer antenna might shield the inner one, or at least change its impedance drastically. 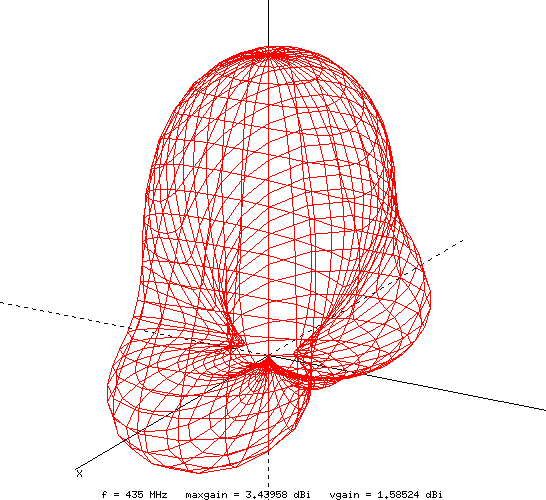 Therefore I created NEC2 models of a single 2 m QHA, a single 70 cm QHA, and various combinations of the two. Some main results are presented below. This is what I eventually built. As it turns out, the two helices can be placed as close together as you like, without much interaction. With just 10 cm space between them, the radiation patterns of both are essentially unchanged. The final reason why I chose this design instead of the one above, was ease of construction, plain and simple. I still think the above design would have been more elegant, though. 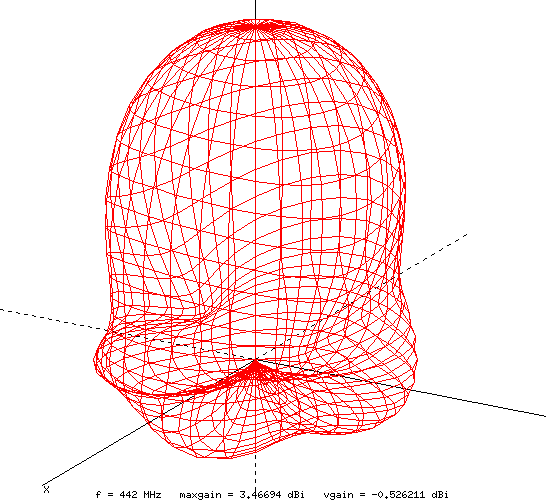 I started by simulating a single QHA. Once I had all the bugs sorted out in my code, the simulation results were in good agreement with Coppens's design tool. The resonant frequency was just a tad off, and SWR was not exactly 1.0, but this could just as well be a non-ideality of the NEC2 simulation. 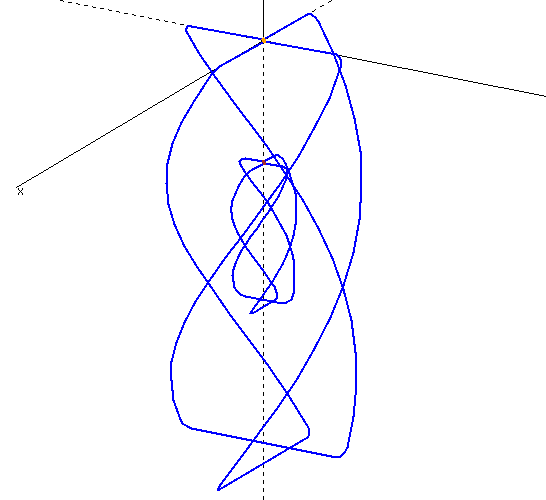 So rather than focus on the SWR curves produced by any one simulation, I compared the results of single helices to those of dual helix arrangements. 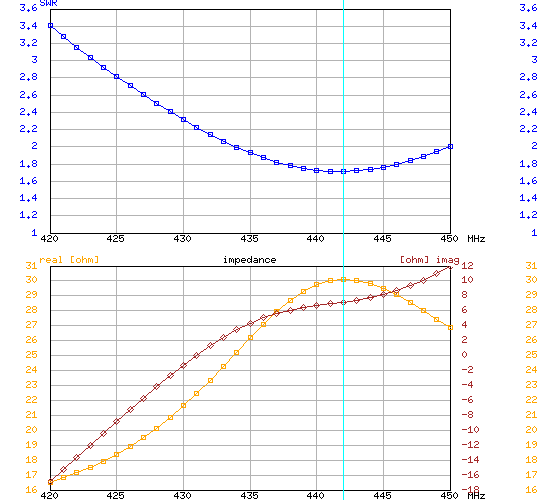 On 2 meters, the SWR curve of the dual helix arrangement was practically identical to a single 2 m QHA. This is to be expected, as the UHF QHA has no resonance on 2 m. However, the VHF QHA does do something funny on 70 cm, which is its third harmonic. It looks like it's not a good enough resonance to be useful (though when testing the completed antenna I noticed it performs just fine also on 70 cm), but I was afraid it would mess up the 70 cm antenna's performance. 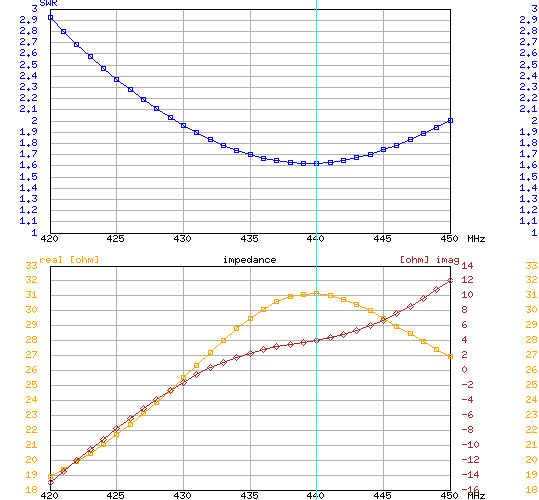 But as it turns out, the SWR curve of the dual QHA combo at 70 cm (right-hand image) remains nearly identical to a single 70 cm QHA (left-hand image). The minimum SWR frequency does move a few MHz, from 440 to 442 MHz. So far so good: the SWR of either antenna remains unaffected by the presence of the other, and even the resonance frequency is unchanged. Also the radiation pattern of the 2 m antenna stays clean, but what does change is the radiation pattern of the 70 cm antenna. Shown here are the 70 cm radiation patterns of a single helix (left), the dual helix combo at its resonance frequency (middle) and the dual helix at its design frequency (right). As can be seen, the radiation pattern seems to change quite dramatically, but the biggest effects are close to the horizon. Overall, the helix still radiates primarily into the upper hemisphere without any major lobes or nulls. So in conclusion, the changes in the radiation pattern aren't really that bad. The polarization does not change by much either. So for a satellite antenna this arrangement just might work! However, with my luck, the relatively deep nulls in the horizon plane would end up pointing straight at the terrestrial repeaters which I also wanted to access... One thing I thought might decrease coupling between the antennas is mirroring one of them, i.e. changing its polarization. This, however, made the radiation pattern on 70 cm even more screwy. Also its polarization became significantly less circular. So I ended up building the two QHAs one above the other, rather than inside each other. With just 10 cm space between the two, both radiation patterns were practically perfect. I don't know about the radiation patterns in real life, but Coppens's online calculator gives very accurate dimensions. Mostly the dimensions are just a tad on the large side—to get the resonance spot on, a centimeter or two may need to be trimmed off the loops of a 2 m QHA. I don't know whether this comes from feedline interactions or other non-ideal garbage, but that has been the trend in most QHAs I've built for any frequency range.